The Site C dam is one of B.C.’s biggest civil works project, and a major part of the construction is under the care of the AFDE partnership. AFDE stands for Aecon, Flatiron, Dragados, and EBC, which are the four construction companies making up the partnership, and undertaking this part of the project. 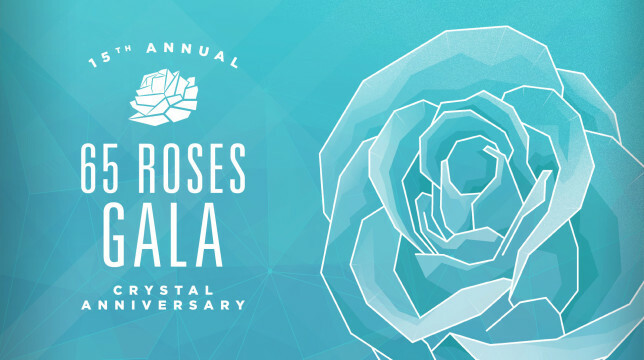 They needed a simple website that made a statement to the public. Transparency is key on this type of project, in order to allow the public to inform themselves about project specifics and job opportunities. Once most of the preliminary project work was completed, the website would act as the main job board for those looking to get involved with the project. 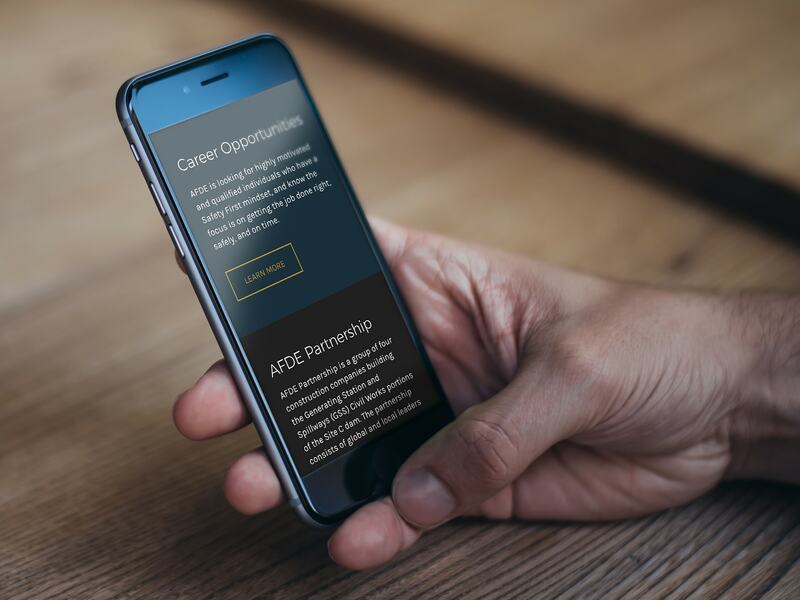 AFDE career and procurement opportunities, as seen on the homepage on mobile. There were several main components that we needed to incorporate into our design and development strategy. The primary purpose of the website was to help AFDE provide information on how construction professionals and companies could get involved with the Site C dam through career and procurement opportunities. Our design needed to reduce any barriers to bringing these groups together. Additionally, the complexity of the AFDE group and Site C dam project had to be clearly communicated to the public. As mentioned above, transparency about what was being accomplished, and who was completing the work, was crucial to retaining public support. It was also necessary for creating a healthy recruitment environment. 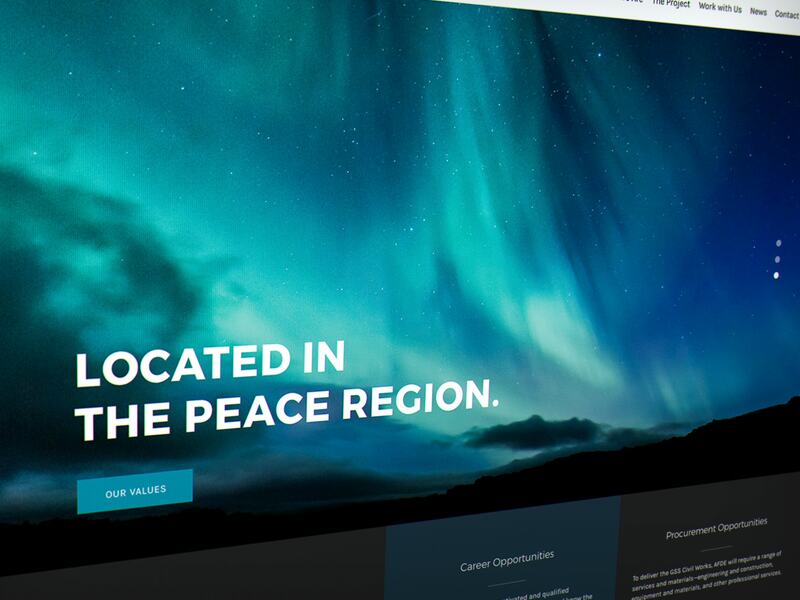 AFDE homepage slide showing the Peace River northern lights. 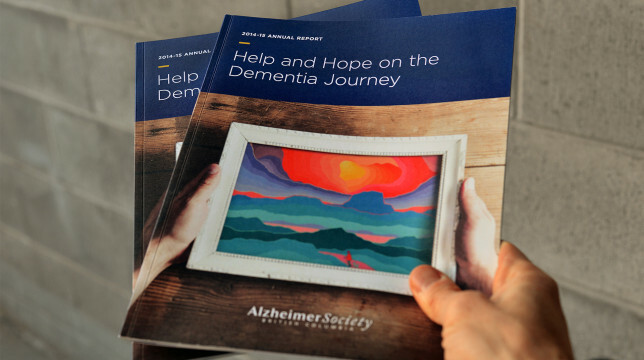 In order to accomplish all three of these, a lot of the creative flair in our design came from high-quality images and renderings of the Peace River area, and the dam site itself. These gave users and job seekers a glimpse into the detailed vision behind this massive project. 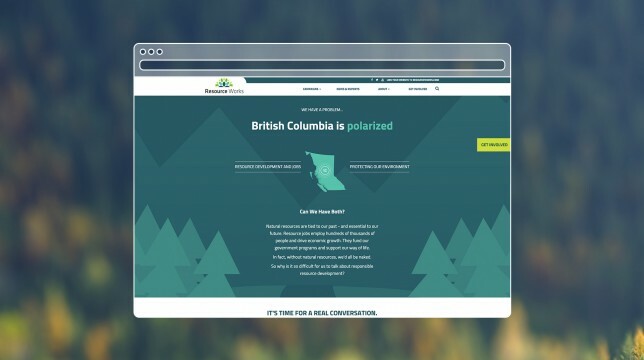 To deal with the issues of attracting workers and procurement partners, and keeping the public informed, we used information and links provided through BC Hydro, the project’s overseer. This ensured accuracy in all communications about the dam. We also included detailed profiles on the four companies comprising AFDE, once again in the name of transparency. 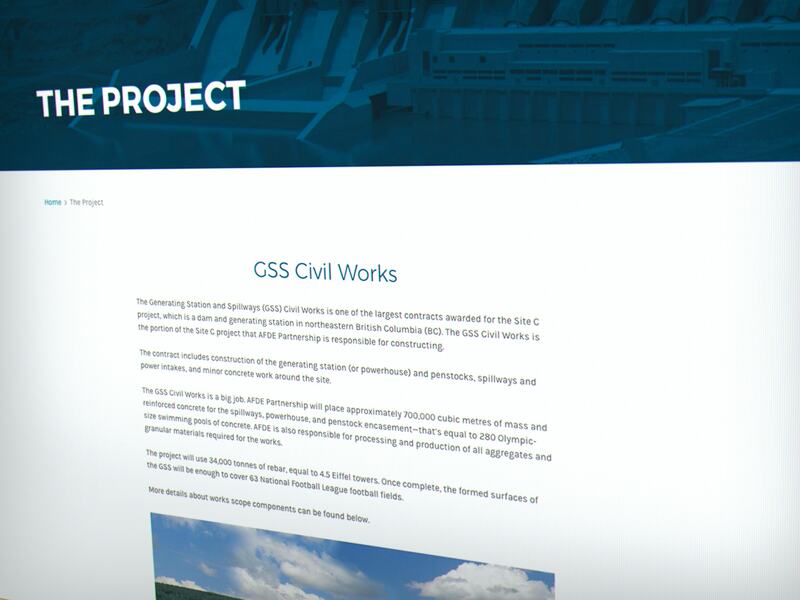 While the Site C dam will be a monument to complex engineering and infrastructure, the AFDE website exhibits a clean design, and a simple information architecture. Career and procurement opportunities are prominently displayed on the home page, as a way to reduce barriers for collaboration. 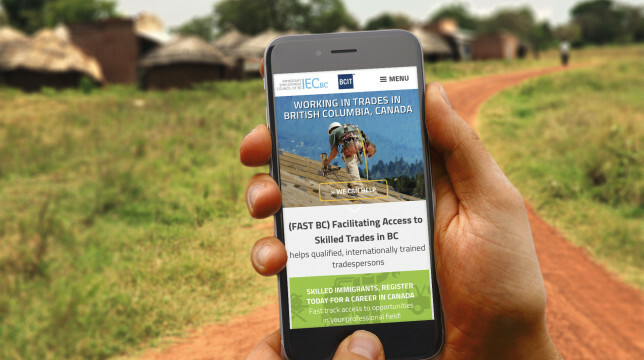 Combining information and design led to an accessible Site C dam resource, which the AFDE uses as a centrepiece of its communications efforts.